Summary (Goodreads): Ever since Tory Brennan and her friends rescued Cooper, a kidnapped wolf pup with a rare strain of canine parvovirus, they’ve turned from regular kids into a crime-solving pack. But now the very place that brought them together – the Loggerhead Island Research Institute – is out of funding and will have to shut down. That is, unless the Virals can figure out a way to save it. So when Tory learns of an old Charleston legend about a famous she-pirate, Anne Bonny, whose fortune was never found, she can’t believe her luck – buried treasure is exactly what she needs to save the Institute on Loggerhead! Trouble is, she and her friends aren’t the only ones looking for it. And this time, the Virals’ special powers may not be enough to dig them out of trouble . . .
Seizure was a fun adventure – how many people haven’t thought of going on a treasure hunt at least once in their lifetime. The pirates were a great way of drawing you into the story, and are in keeping with the history of Charleston and North Carolina. I liked this storyline. I’ve always been a sucker for a good adventure and the Virals gang have a good one in Seizure. From hunting through creepy underground dungeons to visiting an un-inhabited island in the middle of the night. The actual story surrounding Anne Bonny and the treasure was realistic and you can imagine people falling under it’s spell over the years. The Virals get up to just as much mischief as they did in the previous books, although there is somewhat less shooting involved. A lot of night-time adventures and narrowly avoiding getting grounded – again. Kit in particular is a very absentee parent, although I will give the fact that for 13 years he didn’t even know he was a dad a lot of weight in just how often he leaves Tory alone at home without having someone at least check on her. The Virals parents work long hours with a longish commute so I guess there is also that point as well. Anyway the boys are somewhat more reluctant than Tory about some parts of the adventure. Shelton is the most reluctant in some parts with his completely rational and normal fear of spiders. (I hear you man, I hear you.) Also Tory in particular is having problems controlling her ‘Flaring’ as it is sometimes happening when she least expects it, and in public. This understandably has the boys worried because none of them want to end up as science experiments. Although I was glad to see Tory stuck up for herself somewhat with the Skank Tripod, even if she had to flare to do so. Those girls are really nasty. The pirate history was well-plotted and interesting, and I think added an extra element of adventure to the story that wasn’t in the first one. It was also backed up nicely by various research and characters in the story, and I was glad to see that some parts of the mystery weren’t exactly what I had guessed. I hate seeing the entire ending. The treasure was also quite interesting. Which is all I am going to say about it. The teens are still fairly normal teens despite what they have been through together and it was nice to see that. There are a lot of YA novels lately that seem to have anyone with even the slightest of superpowers be either completely oblivious to that fact for most of their lives then accept it like they always had their superpowers, or go completely the opposite direction. The Virals manage to have a freak-out about their newly acquired powers, but also accept that they can’t do anything about it, whether or not they want the powers, without going overboard. 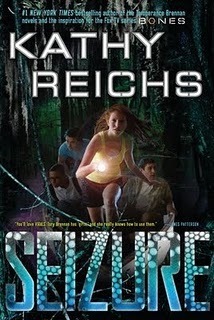 All in all Seizure was a good YA mystery. The science that was in it was nicely explained so that even if you don’t have a real science brain, you can understand it. The mystery was well-plotted and interesting and the adventure was fun.